I went to Hubs Garage late last night and ran into one of my very first SL friends (and wonderful person) from January 2007, the very hunky Jared Coleman. Hubs is a great place to go if you want to see a lot of beefy hot guys in this great West Village - like build. Everyone seemed to be checking out Jared. I kinda ruined the atmosphere of the place cause its supposed to be heavy cruise, and I kinda starting talking in chat with Jared and everyone else (I knew just about everyone there) as soon as I arrived. 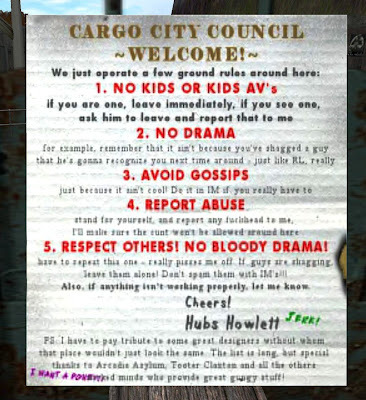 Then I saw Hub Howlett's rule (below) about not gossiping too much (below). I hope Hubs don't tell me to quiet down I come the next time LOL.